Lonnie Wheatley, DODGE CITY, Kan. (August 18, 2018) – Woodward, Oklahoma’s Mike Roach became the first repeat winner of Dodge City Raceway Park’s $1,000-to-win Sport Modified Mayhem event by racing to victory lane in Saturday night’s fifth rendition of Mayhem atop the 3/8-mile clay oval. While Roach topped the 25-lapper from sixth starting position after initially topping the event in 2015, other Saturday night victors included Brendon Gemmill in IMCA Modifieds, Dusty Witthuhn in IMCA Stock Cars and Tathan Burkhart in IMCA Hobby Stocks. 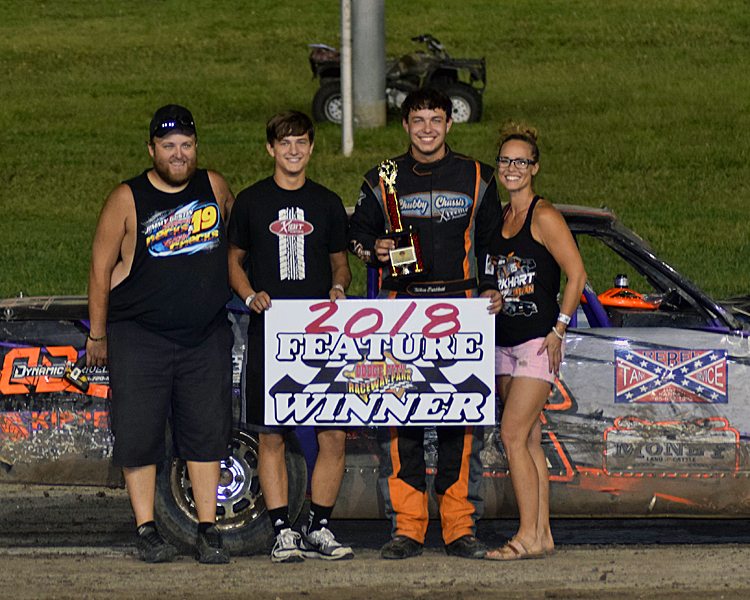 In the 25-lap Fifth Annual Sport Modified Mayhem feature event, Mike Roach needed just four laps to rally from sixth into second and then took the lead away from current IMCA Sport Modified track points leader and defending champion Jeff Kaup on the eighth circuit. Roach led the rest of the way to post his second consecutive victory at DCRP with Brandon Kenney in tow after taking the second position from Kaup on the ninth lap. 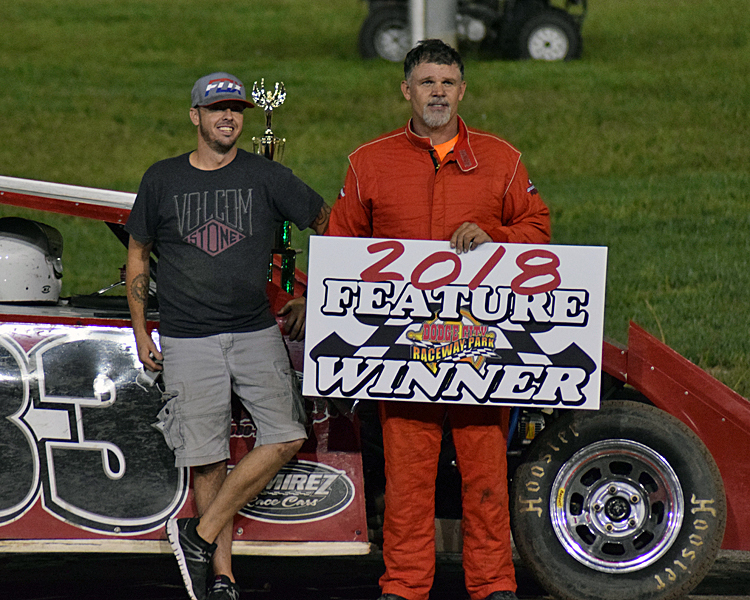 After topping last year’s Sport Modified Mayhem card, Dustin Daniels fell two positions short of going back-to-back by filling out the podium in third with Kaup and Blaine Walt rounding out the top five. 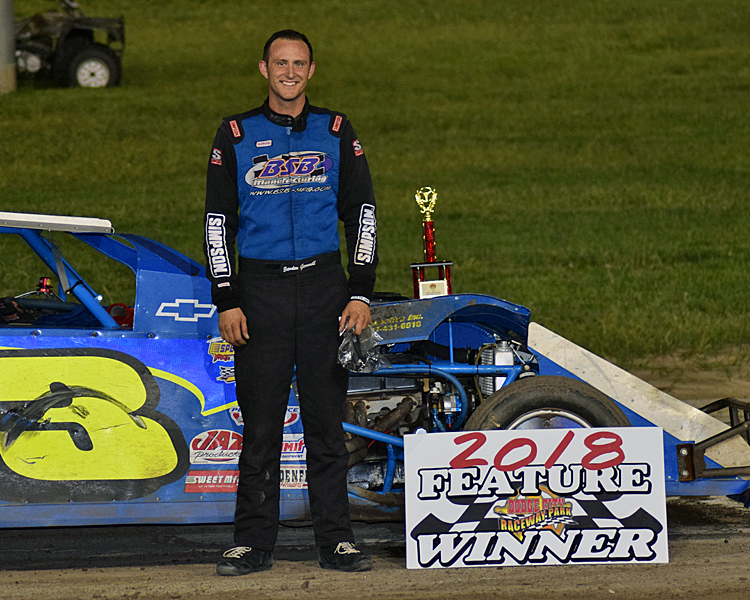 Wichita resident Brendon Gemmill added his second DCRP win of the year as well by charging to victory lane in the 20-lap IMCA Modified main event. After starting eighth, Gemmill worked his way up to second by the ninth round and then took the lead away from Jesse Hoskins on the 15th circuit en route to victory lane. Hoskins settled for runner-up honors with Troy Gemmill, Jesse Smith and Joel Lane rounding out the top five. 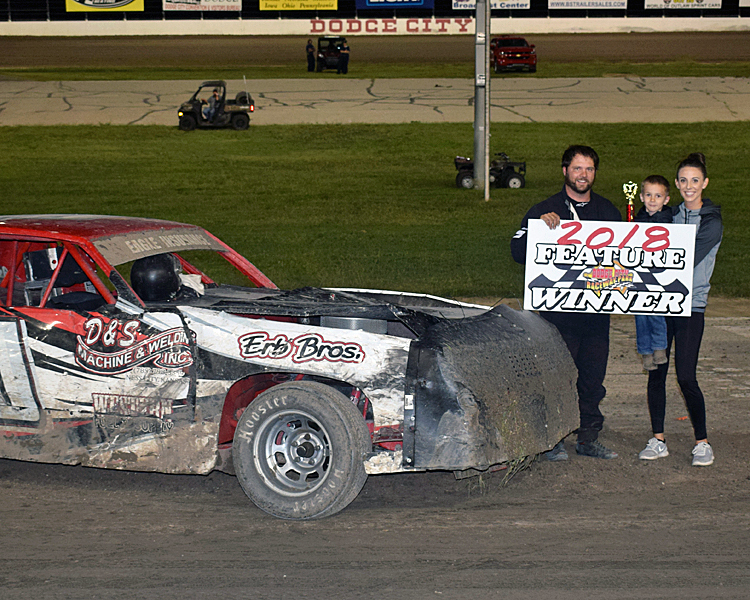 After snapping a three-year winless streak atop DCRP clay last time out on July 27, Dusty Witthuhn made it two wins in a row by besting the 12-lap IMCA Stock Car feature. Witthuhn assumed the lead at the midway point after early leader Tyler Walker and Shannon Maughlin were forced pitside after an incident while dicing for the lead. Witthuhn raced on to the stripe ahead of Ondre Rexford and Chris Oliver. Hays’ Tathan Burkhart added his second IMCA Hobby Stock feature win of the season with a last-lap pass for glory in the 15-lap main event. Burkhart made his way forward from the ninth-starting position and after clawing his way to second by the 11th round, he rallied past Duane Wahrman on the final circuit to snare the win. Wahrman settled for second with Reagan Sellard, Matt O’Hair and Chad Kelley rounding out the top five. Championship chase racing action continues at Dodge City Raceway Park next Saturday night, August 25, with a full card of Precise Racing Products DCRP Sprint Cars, IMCA Modifieds, IMCA Sport Modifeds, IMCA Stock Cars and IMCA Hobby Stocks. The green flag flies at 7:30 p.m.
Heat One (8 Laps): 1. 14w-Blaine Walt, 2. 21b-Brandon Kenney, 3. 7-Jarett Lunow, 4. 4-Freddy McCoy, 5. 4p-Daylon Bergeron, 6. 9jr-Brendyn Nordyke, 7. 8-Brian May, 8. 21h-Dustin Howard. Heat Two (8 Laps): 1. 33r-Mike Roach, 2. 44-Mike Lunow, 3. 3s-Adam Stenzel, 4. 83-Matthew Shenberger, 5. 33s-Slade Roach, 6. 65-Kohl Ricke, 7. 28-Seth Beard. Heat Three (8 Laps): 1. 92-Jeff Kaup, 2. 81-Troy Bynum, 3. 9-Monty Nordyke, 4. 27g-Kamren Gruber, 5. 18-Kyle Wiens, 6. 08-Dakota Sproul, 7. 99h-Nicholas Hankins. Heat Four (8 Laps): 1. 33-Dustin Daniels, 2. 37-Bart Baker, 3. 56m-Mike Appel, 4. 10-Alex Wiens, 5. 21-Joey Maupin, 6. 11h-Denver Howard, 7. 5r-Kaleb Roach. First “B” Main (10 Laps): 1. 4p-Daylon Bergeron, 2. 4-Daylon Bergeron, 3. 33s-Slade Roach, 4. 28-Seth Beard, 5. 65-Kohl Ricke, 6. 9jr-Brendyn Nordyke, 7. 83-Matthew Shenberger, 8. 8-Brian May. DNS: 21h-Dustin Howard. Second “B” Main (10 Laps): 1. 27g-Kamren Gruber, 2. 10-Alex Wiens, 3. 18-Kyle Wiens, 4. 21-Joey Maupin, 5. 5r-Kaleb Roach, 6. 08-Dakota Sproul, 7. 11h-Denver Howard, 8. 99h-Nicholas Hankins. “A” Main (25 Laps): 1. 33r-Mike Roach, 2. 21b-Brandon Kenney, 3. 33-Mike Daniels, 4. 92-Jeff Kaup, 5. 14w-Blaine Walt, 6. 81-Troy Bynum, 7. 37-Bart Baker, 8. 56m-Mike Appel, 9. 7-Jarett Lunow, 10. 4p-Daylon Bergeron, 11. 27g-Kamren Gruber, 12. 3s-Adam Stenzel, 13. 33s-Slade Roach, 14. 18-Kyle Wiens, 15. 4-Freddy McCoy, 16. 9-Monty Nordyke, 17. 44-Mike Lunow, 18. 21-Joey Maupin, 19. 10-Alex Wiens, 20. 28-Seth Beard. Heat One (8 Laps): 1. 71-Jesse Hoskins, 2. 25-Kale Beavers, 3. 7n-William Nusser, 4. 16-Kevin Gray, 5. 85c-Clay Sellard, 6. 8r-Jesse Richter, 7. 26-Tom Beavers. Heat Two (8 Laps): 1. 721-Troy Gemmill, 2. 01-Jesse Smith, 3. 57-Joel Lane, 4. G3-Brendon Gemmill, 5. 7-Clay Money, 6. 88J-Jack Kirchoff, 7. 1n-Nick Link. “A” Main (20 Laps): 1. G3-Brendon Gemmill, 2. 71-Jesse Hoskins, 3. 721-Troy Gemmill, 4. 01-Jesse Smith, 5. 57-Joel Lane, 6. 25-Kale Beavers, 7. 8r-Jesse Richter, 8. 16-Kevin Gray, 9. 7-Clay Money, 10. 1n-Nick Link, 11. 7n-William Nusser, 12. 26-Tom Beavers, 13. 85c-Clay Sellard, 14. 88J-Jack Kirchoff. Heat One (8 Laps): 1. 20-Tyler Walker, 2. 17m-Shannon Maughlin, 3. 3-Chris Oliver, 4. 22-Donald Kaup, 5. 33-Marlin Hogie, 6. 10-Dusty Witthuhn, 7. 97x-Ondre Rexford, 8. 17-Ryan Keller. “A” Main (12 Laps): 1. 10-Dusty Witthuhn, 2. 97x-Ondre Rexford, 3. 3-Chris Oliver, 4. 22-Donald Kaup, 5. 33-Marlin Hogie, 6. 20-Tyler Walker, 7. 17-Ryan Keller, 8. 17m-Shannon Maughlin. Heat One (8 Laps): 1. 250-Tathan Burkhart, 2. 2m-Matt O’Hair, 3. 17w-Duane Wahrman, 4. 57-Chad Kelley, 5. 7-Tom Reed, 6. 55-Jacob Huse. Heat Two (8 Laps): 1. 19-Brett Copeland, 2. 2s-Reagan Sellard, 3. 81d-Mike Davis, 4. 69-Danny Schulte, 5. 3-Brian Thomas, 6. 24b-Sheri Berger. “A” Main (15 Laps): 1. 250-Tathan Burkhart, 2. 17w-Duane Wahrman, 3. 2s-Reagan Sellard, 4. 2m-Matt O’Hair, 5. 57-Chad Kelley, 6. 69-Danny Schulte, 7. 19-Brett Copeland, 8. 7-Tom Reed, 9. 55-Jacob Huse, 10. 81d-Mike Davis, 11. 24b-Sheri Berger, 12. 3-Brian Thomas.